Graham Centre member Dr John Broster has received international recognition as part of a team awarded the outstanding research paper in Weed Technology by the Weed Science Society of America. 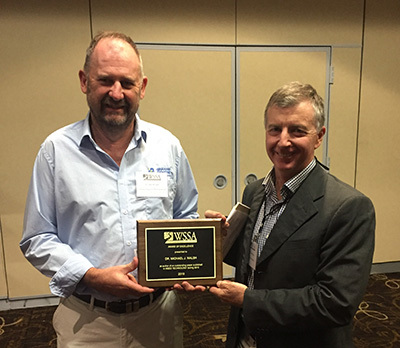 Dr Broster and his colleagues Dr Michael Walsh (lead author), University of Sydney and Professor Steve Powles, University of WA were recognised their paper titled ‘iHSD Mill Efficacy on the Seeds of Australian Cropping System Weeds’. Their paper evaluated the efficacy of the integrated Harrington Seed Destructor (iHSD) mill on the seeds of Australia’s major crop weeds during wheat chaff processing. It also examined were the impacts of chaff type and moisture content on weed seed destruction efficacy. Harvest weed seed control, such as the iHSD is becoming increasing sought after due to the widespread evolution of multi-resistant weed populations and this research provides important information about its compatibility with conservation cropping programs. Dr Broster and Dr Walsh attended the Weed Science Society of America’s annual conference in New Orleans to receive the award.